These free coffee table plans will help you build a wonderful centerpiece for your living room that looks great and is very functional. Building a coffee table is an easy woodworking project, and with these free detailed plans, you'll have one built in just a weekend. Be sure to browse through all the free coffee table plans so you can choose a style that's right for your home and requires a skill level that matches your talents. You'll find simple, rustic, contemporary, mission, farmhouse, and modern coffee table plans here. 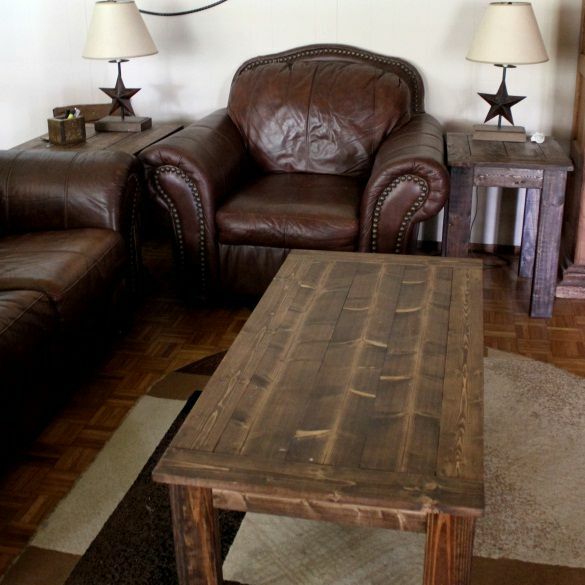 Here's a rustic coffee table plan that is built out of solid wood and looks great with any style of decor you have. This free coffee table plan includes a materials and tools list, cut list, instructions, diagrams, and photos submitted by users who have built this coffee table. Your friends and family are going to be so impressed when they see this factory cart coffee table in your living room. And even more so when they find out that you built it. This also would make a great entertainment center for your television. Color photos and building directions will take you through creating this coffee table for your home. Ana White has come up with another fantastic free coffee table plan that will build you a beautiful rustic coffee table that is a breeze to build. It even has a bookshelf on the bottom that you can use for just about anything. You'll find diagrams, building directions, photos, and more all included in this free coffee table plan. If you're looking for more storage in your home, and who isn't, you're going to want to take a look at this free coffee table plan that includes two crates that slip inside. You could store all kinds of items in there, they can even act as a toy box. You can download complete blueprints for this project that includes everything you need to build it. Lowe's has a free coffee table plan that will result in a display top coffee table so you can show off decorations or keepsakes. The coffee table plan comes complete with project diagrams, a cutting list, instructions, and photos. Here's a great looking coffee table plan that will build you a sturdy table that would look good in a rustic or contemporary home. Everything you need is here - a cut list, material list, tool list, and step-by-step directions. You'll have this coffee table built in just 4 hours for a cost less than $50. Here's a free plan for a sawhorse coffee table that can fit almost any style depending on the wood and finishes you choose. There's a required tools list, materials list, diagrams, color photos, building instructions, and lots of finishing tips. More Like Home has a free coffee table plan available that builds a 3-drawer coffee table inspired by the Rhys Coffee Table from Pottery Barn. If you love this free coffee table plan, you're in luck because there are also plans here for a matching end table and console. Here's another knock-off free coffee table plan inspired by Pottery Barn's Benchright Coffee Table. You'll save hundreds of dollars and have a great time building this stunning coffee table from easy to use plans. Cherished Bliss has a free coffee table plan that would fit perfectly in a modern, rustic, or farmhouse style home. It is a great plan for a beginner and includes a supply list, cut list, diagrams, instructions, and color photos. Finishing instructions are included as well. DIY Huntress has designed a free coffee table plan that's truly a piece of art. It has a geometric design that really pops. Hairpin legs hold the table up, making it a quick project to complete. Sincerely, Marie Designs made this DIY coffee table plan for Build Something and those fans of modern farmhouse decor won't want to miss it. It's a two-toned table that's square, so it fits great in front of a sectional. You'll find a tools list, materials list, parts, and cut list, step-by-step building instructions, and diagrams all included in the plan. Little Glass Jar has designed this faux Industrial style coffee table that's built all from wood and uses two different colors of stain to give it a metal look. The best part is that it cost under $75 for the supplies to build it. There's a supply list, written directions, and detailed color photos so you can make this coffee table too. If you are looking for a truly simple coffee table plan, you'll want to download this free plan from Paper & Stitch. The finished product will result in a modern looking coffee table that can be rolled wherever you need it. Here's a free coffee table plan for a truly rustic coffee table complete with wheels and a rope handles on the side. The step-by-step instructions along with color pictures will help you build this coffee table in a day or two. This free coffee table plan to build a beautiful mahogany coffee table inspired by Scandinavian design. The PDF download of this free coffee table plan includes everything you need to get this coffee table built and ready to use in your home. Over at Rockler, you'll find a free coffee table plan for a mission-style table in the Arts & Crafts tradition. Photos, diagrams, and instructions will help you build this coffee table. If you are a fan of mission style furniture, then this free coffee table plan may be just what you're looking for. The free coffee table plan comes complete with instructions, a tool list, and materials list, blueprints, and user comments. If you're small on space, then this small oak contrast coffee table plan might work well for you. The free coffee table plan includes photos, diagrams, and step-by-step building instructions. Workbench Magazine has a free coffee table plan available as a PDF download that includes diagrams and instructions. 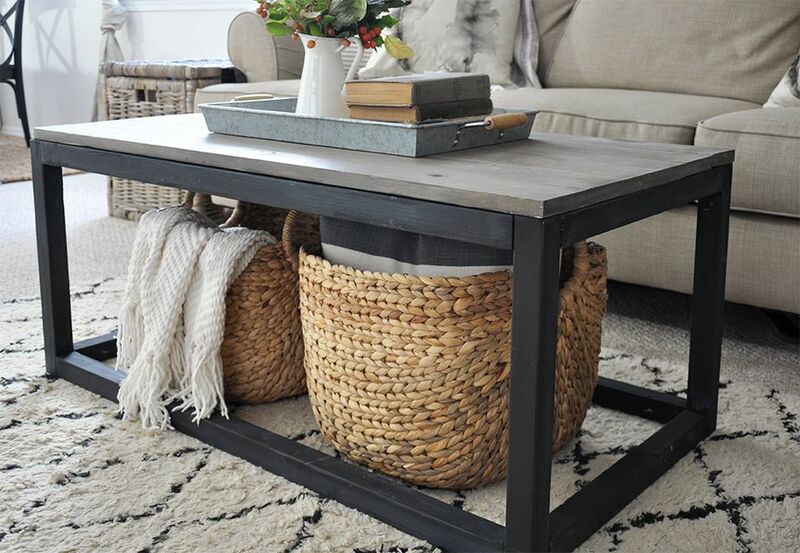 The finished result will get you this coffee table that has tons of room for baskets or ottomans below. Here's a no-fuss coffee table plan that will build you a simple rectangle coffee table 2 ft. by 4 ft.
You'll find blueprints, cutting list, tools list, and all the instructions you need in this free coffee table plan.